If you tried to buy a ticket to the Broadband Forum event that we held last week, you probably noticed you could buy online, and that we were accepting EcoCash, ZimSwitch Vpayments and even VISA. And it worked seamlessly both for us and the people paying. 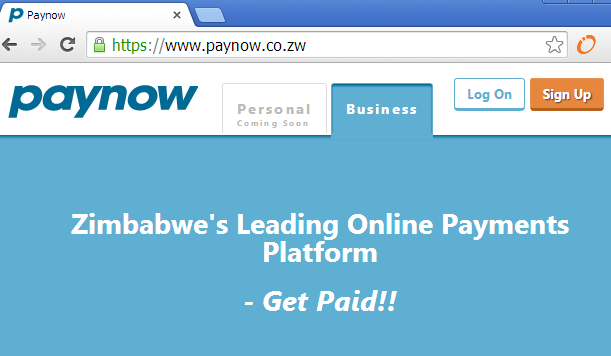 We were using the new internet payments platform by Webdev called Paynow. The platform has been live for a couple of weeks now. Like all other services on the market – ZimSwitch’s Vpayments, Pay4App, PesaPal, FloCash – at the core, Paynow enables anyone with a website or app to start receiving payments online from major credit cards as well as, for some at least, local bank cards and local mobile money wallets. So yes, Paynow comes to a market where a number of solutions have been launched already but introduces one key thing that has been seriously lacking. Simplicity. From the point of signing up for a merchant account, setting it up on a website, and getting your money into your bank account, everything is simple and straightforward. We also liked that there’s no waiting. You sign up for a merchant account by providing your bank details and you’re ready to start receiving payments. The bank itself is not involved at all in the signup process. Paynow also allows you to receive payments direct to your bank account as people pay. It doesn’t matter if payment was made via EcoCash, Visa or ZimSwitch Vpayments, the money comes to your one bank account. And it comes with no threshold conditions to be met. We loved how Paynow performed for the Broadband Forum. It simplified payments a lot for us so it takes the prize as one of the most promising payments startups to come out of Zimbabwe. Hell, Africa! It may be a while before our government and the US (government and companies) are happy to work with each other, and we’ll let the politicians do the politics. In the meantime, it’s great that PayPal’s absence is forcing the birth of a crop of startups that will be relevant to solve local problems and may even be relevant globally. Neh, I compared the two. They all run atop ZimSwitch’s and EcoCash’s official APIs (Pay4App is still to use that it seems, but they hinted the move) and beyond that offer nothing more. I don’t know, still feel there is little innovation to come into that space, maybe because the underlying providers are strict? Beats me. Has anyone compared their API implementations (PayNow, ZimSwitch’s Vpayments, Pay4App, PesaPal, FloCash), which one is a joy to work with?